The advent of new media technology in Africa, in the 1990s, sparked celebratory, almost utopian bliss in its proponents. It was accompanied by the hype about the continent’s possibility of “leapfrogging” some stages of development, as though the whole process of development had been rendered less problematic. A linearity of progress was assumed, almost uncritically positing new media technology as deterministic of social progress. Yet, after over a decade of the emergence of new information and communication technologies (ICTs), the old questions about access, inequality, power, and the quality of information available are still valid (cf. Fourie, 2001). This calls for a more critical rethink of the social and political impact of new technologies on the African polity. 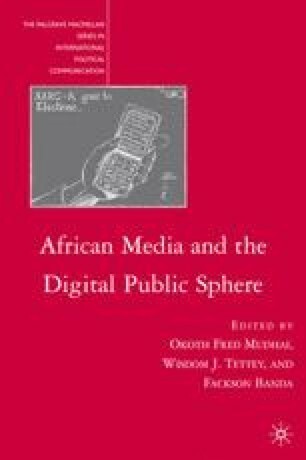 This book makes a significant contribution to the discourse around these questions by bringing together a collection of chapters that explore the correlation between new media technology and democracy in Africa, as well as the nature of their juxtaposition with “old” or “traditional” media. To set the context for these analyses, this introductory chapter provides a critical analysis of the conceptual and theoretical debates surrounding the new media/political engagement/democratic participation/good-governance nexus, and anchors them in the specific reality of the African situation. AllAfrica.com. 2006. East Africa: EASSy Project to cost $280 Million, http://allafrica.com/stories/200608290061.html (accessed September 8, 2006). Hagen, M. 1997. A Typology of Electronic Democracy. http://www.uni-giessen.de/fb03/vinci/labore/netz/hag_en.htm. (accessed September 5, 2006). Huber, B. 1998. Communication Aspects of Participatory Video Projects: An Exploratory Study. http://ictupdate.cta.int/index.php/filemanager/download/236/ (accessed February 5, 2007). Jensen, M. 2002. African Internet Status. The African Internet—A Status Report. http://www3.sn.apc.org/africa/afstat.htm (accessed September 8, 2006). Poster, M. 2000. CyberDemocracy: Internet and the Public Sphere. http://a-r-c.gold.ac.uk/a-r-c_Two/print_mark.html (accessed September 5, 2006). Rensburg, R. 1994. “Community Development: Essential Contribution or Paternalistic Communication?” Dialogus Online 1(1). http://www.umsa.ac.za/dept/kom/d11radio.html (accessed December 12, 1998). Servaes, J. n.d. Development Communication-for Whom and for What? http://www.unisa.ac.za/dept/press/comca/211/servaes.html (accessed 12 December, 1998). Tomaselli, K. n.d. Politics of Development. http://www.sacod.org.za/report/politicsofdevelopment.htm (accessed February 5, 2007).